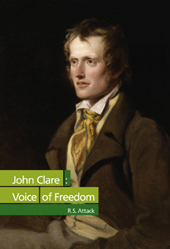 The poet John Clare (1793-1864) was a remarkable figure. Coming from a poor labouring family in Northamptonshire where, despite his families poverty he had a limited education and then continued to teach himself. Fascinated by poetry at a young age he briefly became celebrated in his own time, but it was only decades after his death that his true worth was understood. Much of his life was spent working low paid agricultural jobs or unemployed and financial concerns were a constant worry - like the majority of the English population at this time. In this short biography, R.S. Attack describes Clare as "one of England's foremost nature poets" and a "self educated genius", but the main thrust of her book is to locate Clare at the heart of the social changes taking place in the English countryside during his lifetime. Clare was fascinated by the natural world and the people of the small rural community he lived in. When, later in his life, he was forced to move to a new home funded by one of his patrons, he described the process as "flitting" and it clearly contributed to his mental health issues. But Clare was unable to separate his poetry about people, nature and places from what was happening to the countryside and its communities. Will riches keep 'em from the grave? These changes were the enclosures of the common lands that the labouring population of the countryside relied on. Their destruction led to impoverishment on an enormous scale. The disposed populations became rootless and homeless, often ending up in the cities as factory fodder, or poverty stricken reliant on temporary and low paid work. It is this that drives Clare's poetry and gives him his emotion. Yet it was this side of him, Attack argues, that was deliberately kept out of public view. His political poems (though as Attack points out, Clare did not seem himself as "political") where never published. His non-political poems were sometimes very popular, partly because Clare was seen as unusual - the "peasant poet". Despite this popularity Clare rarely received any money, and relied on a number of wealthy patrons. This poem was begun & finished under the pressure of heavy distress with embittered feelings under state of anxiety & oppression almost amounting to slavery - when the prosperity of one class was founded on the adversity & distress of the other - The haughty demand by the master to his labourer was work for the little I chuse to alow you & go to the parish for the rest - or starve - to decline working under such advantages was next to offending a magistrate & no opportunity was lost in marking the insult by some unqualified oppression. Clare is thus the voice of those whose lives were destroyed by enclosure, but also those that remained working in the countryside. Paid poverty wages, exploited and downtrodden by the employers and authorities. Clare's own parents were only saved from the workhouse by the benevolance of publishers and friends. He worried constantly about rent arrears and poverty, and this probably was part of the decline in his mental health. Clare spent the last 23 years of his life in an asylum, though he seems to have a relatively comfortable life there. During this period he wrote some of his best poetry, though it was also his least political. Clare's life reminds me a little of his contemporary poet Percy Shelley. They were hardly of the same class, though they shared a radicalism, and neither's radical poetry was really to see the light of day until long after they had died. Shelley's radicalism went much further than Clare's. But today Clare's poetry deserves recognition again. Not just for the beauty of his words, but because, as the author points out, the "consequences of the enclosure movement" remain with us, and there is still a battle for justice and equality to be won. Clare was also a traditional fiddler who played all over Nothamptonshire and collected almost 300 traditional tunes, collected in two volumes. There's a biography by George Deacon with many of the tunes. The itinerant musician was one of Clare's lifelong occupations and it gave him a strong sense of class consciousness. His tunes, often versions of tunes found in other collections, are still played in music sessions.